What could be more romantic than sharing the sunrise together on the famous Charles Bridge, one of Europe's most beautiful bridges? I love the atmosphere and mood of this image. The warm morning glow, the sun flare, the old-world feel of the lanterns, and the tender whispers between the couple... The original Bohemian town, Prague is actually the couple's hometown but they generally avoid the bridge as it is usually overrun with tourists. But not at 6am! The groom is a Czech commercial photographer & recommended an early start to the session to ensure we had a chance at shooting without hundreds of tourists in every photo. We are definitely not early risers, but for a shot at a great image like this we were happy to set our alarm clock! 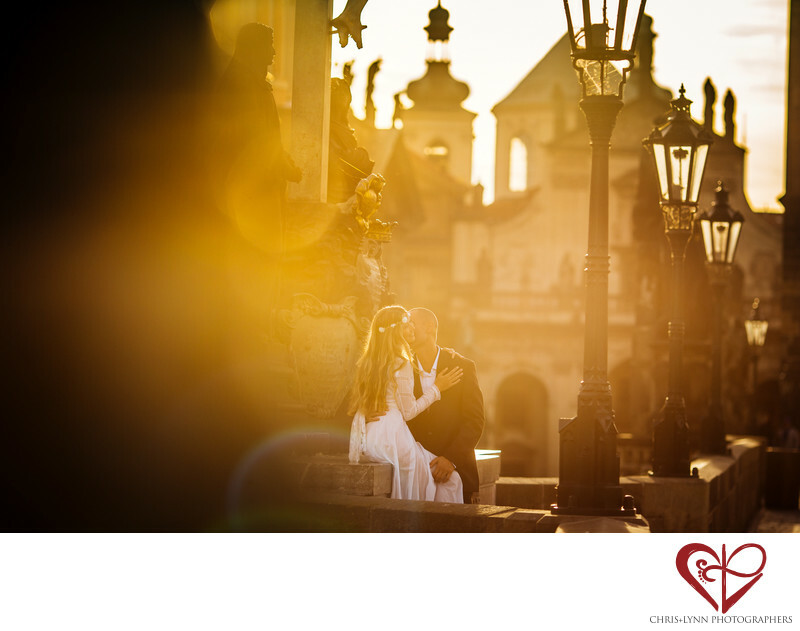 The couple told us this photography session was so special because they got to see their city with fresh eyes and experience sunrise on the Charles Bridge, something they had never done before despite living their entire lives in Prague. This image was shot on our Canon 135mm f2.0 lens to compress the lanterns and statues on the bridge. Shooting almost directly into the rising sun created the lens flare that gives this image much of its magic. Location: Charles Bridge, Prague, Czech Republic. 1/1250; f/2.8; ISO 100; 135.0 mm.